A council has offered its help to build a bridge over a rail crossing where eight people have died. Network Rail said last week that a bridge was its preferred option but it would depend on getting consent from landowners. West Berkshire council had previously voted in favour of a full barrier at the Ufton Nervet crossing. But the authority said it welcomes any safety measures and offered to assist with planning or highways issues. 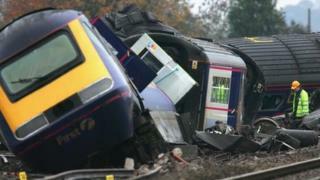 In 2004 a train derailed killing seven, and in May this year a man on a moped died on the level crossing. Councillor Keith Chopping, member for highways and transport, said: "This has been some time coming but we welcome the decision. "Although the council voted for a full barrier crossing, we are pleased to see that Network Rail's proposal is for the provision of a road bridge, providing they can secure government funding."